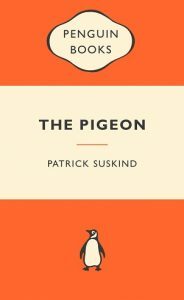 The Pigeon is a truly strange and vividly intense novella. The narrative covers a single 24 hour period in the life of a Frenchman, with every action and emotion expressed in graphic, almost violent, prose. This is not the kind of story that is particularly enjoyable or relaxing to read, because it is so overwhelming, but it is a really fascinating example of the potential of literature. The protagonist’s identity is almost completely obscured by the paranoia and intense emotions he experiences and the dramatic way in which small details are expressed. There are some truly brilliant passages throughout, that deal with everything from humanity’s fickle and fleeting existence to terror felt when a hole is torn in one’s pants while in public. It’s difficult to imagine what would lead a writer to having a character believe a simple clap of thunder heralds the apocalypse. There are echoes of unresolved abandonment, desire for order and rigidity in the face of a past filled with chaos, but at the same time it’s a story about a man whose day is disrupted by a pigeon. Finishing this novella is like breathing in a huge gulp of fresh air after a long time in a cramped and stuffy elevator. The rain that falls on the last few pages forms a symbolic ‘washing away’ of the pigeon trauma, and also cleanses readers of the anxiety and paranoia that escalated throughout the story. I can’t say that I particularly enjoyed reading this book, but nor can I say that I regret reading it. Suskind’s writing style is so intriguing that I will definitely be looking out for more of his work. I would recommend this if you have a short trip via plane, train or bus, and can sit for the hour and a half that it would take to read this in a single sitting. Despite the surface simplicity of the tale it’s one that keeps coming back to me since finishing it, little sentences here and there jumping out at me, so in that sense it is truly a memorable read. Suitable for ages 15 and up, but probably best enjoyed by readers who have been employed in at least one truly tedious job.